Gandalf was an Istari Wizard who was one of the wisest of beings. His wisdom and courage helped him survive the War of the Ring and was key in the destruction of Sauron. Gandalf spent two thousand years opposing Sauron, and finally he created a network of plans to defeat him. Gandalf was a Maiar, or a servant of the Valar. He was the wisest of this high race of gods. He was known in the far west as Olorin. Olorin spent time with the Elves in the Undying Lands disguised as one of them. From the Elves, Olorin learned much of his wisdom and powers. He lived for a time in Lorien, the gardens of Irmo. Olorin travelled the uttermost west and, near the Walls of the World, he met Nienna. He visited her often and learned many of his mighty skills from her. The Valar Manwe and Varda also lived at the Walls of World. Olorin befriended the couple and visited them on the peak of Taniquetil frequently. They admired his qualities and decided to send him to Middle-Earth in circa 1000 of the Third Age. They wished him to oppose Sauron, the one threat to Arda that remained after the banishment of Morgoth. Olorin took the body of an old man. Olorin arrived in Middle-Earth after passing over the Great Sea. Saruman, Radagast, and Alatar and Pallando accompanied him. In the Grey Havens of western Middle-Earth, Gandalf met the Elf Cirdan. Cirdan immediately saw how good Gandalf was and how much trouble awaited him. He gave him the Ring Narya as a gift. Olorin met Elves and Men in the new continent. He roamed the entire place and saw all cultures and was friendly to all. Elves called him Mithrandir and men called him Gandalf the Grey. Gandalf dressed in a grey cloak and pointed hat and had a grey beard and bushy eyebrows. After being in Middle-Earth for about one hundred years, Gandalf learned of the dark lord Sauron's stronghold in Dol Guldur in Mirkwood. Gandalf and the other wise originally mistook the evil in the forest for one of the Nazgul, but they soon came to fear that it may have indeed been Sauron. It had been believed that Sauron had been defeated by Isildur in the War of the Last Alliance, but in 2060 the wise feared that the existence of the One Ring prolonged his life. In 2063 Gandalf investigated Dol Guldur and Sauron fled into the East for nearly six hundred years. In 2460, the Watchful Peace ended with Sauron returning to Dol Guldur. In response to this, the wise formed the White Council in 2463. It consisted of Gandalf and the white wizard Saruman and the wisest of the Elves. Saruman was named head of the Council, despite the fact that Galadriel had encouraged Gandalf to receive this title. In 2850, Gandalf returned to Dol Guldur and found Thrain II imprisoned there. Thrain gave Gandalf his map of the Lonely Mountain and told him it would be wise to reclaim it. He also gave him a key to the secret passage. After this, Thrain perished, not even remembering his own name. Gandalf worried that Sauron would use the dragon Smaug to cause trouble amongst dwarves and the people of Dale while his Orcs attacked Rivendell and Lothlorien. Gandalf did not know what to do with the key and the map he had received from Thrain. By coincidence in 2941, Gandalf met Thrain's son Thorin Oakenshield in Bree. Thorin and Gandalf agreed to reclaim the Lonely Mountain to lessen the troubles in the north. Thorin was to appoint twelve Dwarves and Gandalf was to pick a Hobbit. He picked Bilbo Baggins, who was the son of Belladonna Took. Gandalf admired Belladonna greatly and decided that nominating her son as a member of the company would honor her. Gandalf was very fond of the Hobbits. He visited the Shire frequently and came to know most of the Hobbits there. In April of 2941, Gandalf came to Bilbo's home at Bag End, but he claimed to have no interest in a journey. Gandalf decided that Bilbo should be the burglar and he placed a sign on his door indicating that he was a burglar looking for work. When Thorin and his company of dwarves reached Bag End at tea time, Thorin was disappointed. Gandalf argued that he thought Bilbo was the exact fit for the role needed. On April 27, Gandalf led Bilbo out of the Shire with the dwarves. In the Trollshaws, Thorin and company were captured by Trolls named Tom, Bert, and William Huggins. Gandalf tricked the trolls into fighting by making his own voice sound like one of theirs and saying insulting things. They stayed up all night arguing and turned to stone in the light of the morning. Gandalf found the sword Glamdring in the Trolls' lair, which was originally a sword of Gondolin. The company soon reached Rivendell where they were housed by Elrond. They left and made their way over the Misty Mountains and were met with a storm and angry Giants. The company hid from the storm in a cave called the Front Porch in the High Pass. They were captured by Orcs and their ponies were eaten. Inside the mountain, Gandalf saved the dwarves from the Orcs and chopped off the head of the Great Goblin using his new sword. He led the dwarves out of the mountains, but Bilbo was no longer with them. He appeared later that day with the One Ring and told his tale of an encounter with Gollum. He lied several times until Gandalf threatened him with his staff. Beyond the Misty Mountains, the company was attacked by Goblins and Wargs. Gandalf ordered the dwarves and hobbit to climb a tall tree and they were saved by Eagles. The windlord had been healed by Gandalf in the past and in return he brought the companions to Mirkwood. Gandalf introduced them to Beorn and they stayed the night at his house. In the morning, at the edge of Mirkwood, Gandalf took leave of the company and headed south. Gandalf met the White Council in the summer. They discussed the important matters of Sauron and Gandalf encouraged them to attack. They all agreed and their forces attacked Dol Guldur, but Sauron fled to Mordor. Gandalf travelled straight to the Lonely Mountain to find Lake-men and Wood-elves surrounding it. Smaug had been slain, and Bilbo came forth offering the Elves and men the Arkenstone. The fighting did not stop until a Host of Goblins and Wargs attacked and the Battle of Five Armies broke out. When the battle was won, Gandalf and Bilbo headed northwest to the Shire. They camped at Rivendell before continueing on. After Bilbo was settled in at Bag End, Gandalf rushed south to meet with the White Council. In 2951, Sauron revealed himself to be at his stronghold in Mordor. The council discussed this at great length and Saruman convinced them that the Ring was lost in the Anduin and had surely flowed into the Great Sea, meaning Sauron would never find it. Gandalf became increasingly worried about the One Ring. In his visits to the Shire, he noticed Bilbo did not age with his magic Ring. He soon found out that the creature Gollum had once had the Ring, and he began to track him down. Gandalf's Wood-elves lost Gollum's trail and Sauron found the wrecked creature first. In 2956, Gandalf met Aragorn, the heir to the throne of Gondor. The two made fast friends and walked the borders of Mordor together. Gandalf noticed Aragorn's heroic personality. On September 22, 3001, Gandalf went to the Shire to attend Bilbo's Farewell Birthday Party. Bilbo was one hundred eleven, and Gandalf was suspicious that Bilbo's Ring was in fact the One Ring blessing him with long life. He thought it was time for Bilbo to take one last adventure to Rivendell and pass the Ring down to his young cousin Frodo Baggins. At the Farewell Party, Gandalf used his staff to create fireworks. Bilbo used the Ring to disappear and Gandalf became angry, for it was most unwise to use magic in front of beings such as Hobbits. At Bag End, Bilbo was very greedy and reluctant to let the Ring go. When he finally did so, he felt he had been freed from a major weight. Gandalf rushed from the Shire to find Aragorn. He wished to learn more about the history of the One Ring which Frodo now possessed. Gandalf and Aragorn decided to continue hunting for Gollum and did not find him for many years. Gandalf payed frequent visits to the city of Minas Tirith. He became acquainted with the Steward Denethor, who resented the wizard. Denethor's son Faramir took a great interest in Gandalf and followed him into the libraries of Gondor to read. Gandalf found in 3017 that upon the Ring it was engraved "One Ring to rule them all, One Ring to find them, One Ring to bring them all and in the darkness bind them." Gandalf found out that the Ring Bilbo had possessed was most certainly the One Ring of Sauron and that Gollum had killed Deagol for it in Gladden Fields. Gandalf made great haste to the Shire to find Frodo at Bag End in April of 3018. He cast the Ring into the Hobbit's fireplace to find the engravings. He officially knew that it was the One Ring at this moment and informed Frodo of this. Gandalf told Frodo of the One Ring's heritage. Horrified by the story, Frodo offered Gandalf the One Ring. Gandalf did not accept but instead urged Frodo not to tempt him with it. It was soon official that Samwise Gamgee would accompany Frodo on his journey from the Shire. Frodo was to take the Ring to Rivendell where it would be decided what to do. Gandalf frantically searched for Aragorn and found him at Sarn Ford on May 1. Gandalf told Aragorn news of Frodo's secret journey. Gandalf soon heard word of evil shadows in the Shire regions so he rode down the Greenway to Bree. Radagast told him to report to Isengard by orders of Saruman. Gandalf told Radagast to tell all of his animal friends to be on the look out for the Nazgul. Gandalf then went straight to the Prancing Pony and gave a message to the innkeeper Barliman Butterbur telling Frodo to leave the Shire immediately. Barliman forgot about the message and Frodo did not leave until it was almost too late. At Isengard, Saruman revealed to Gandalf that he wished to join with Sauron in order to get the One Ring for himself. He offered Gandalf a chance to join forces with him, but Gandalf refused the offer. 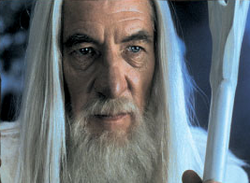 Fighting occurred between Gandalf and Saruman and Gandalf was imprisoned in Orthanc. Gandalf watched as the land of Isengard was spoiled with industry. With luck on September 18, Gwaihir flew to Isengard by chance and found Gandalf, whom he rescued and brought to Edoras. There Theoden, King of Rohan, dwelt under the spell of Saruman. The corrupted king dismissed Gandalf, telling him to "take any horse and go." The wizard found a mearas named Shadowfax in the stables of Edoras and tamed him. Gandalf rode Shadowfax day and night until he returned to the Shire on September 29. Hamfast Gamgee informed him that Frodo had left with Sam on September 23. Gandalf traveled to Crickhollow and found that the house that Frodo had bought had been attacked by Nazgul. Gandalf rode to Bree with haste to find that the Hobbits had left earlier with Aragorn. He rode to Weathertop only to engage in battle with the Nazgul on October 3. The flashes of light from the battle lit the Tower of Amon Sul and the surrounding area. Gandalf escaped and rode through the Ettenmoors in order to lose the Nazguls' trail. On October 18, Gandalf reached Rivendell where he heard that Glorfindel had gone out to find Frodo. On October 20, Glorfindel returned with Frodo and they reached the Ford of Bruinen. Gandalf and Elrond started a great wave of horses and boulders to temporarily defeat the Nazgul. Elrond helped cure Frodo of his wound from the Morgul-knife and Gandalf watched over Frodo in bed as the Hobbit recovered. On October 25, Gandalf attended the Council of Elrond. He convinced the Council that Saruman had joined with Sauron and it was decided that the Ring should be destroyed in Mordor, where it was made. Gandalf told the Council that Sauron would not expect this in the least. When Frodo volunteered to perform such a task, Gandalf immediately offered to join him. On December 18, Gandalf told Elrond that Meriadoc Brandybuck and Peregrin Took should accompany the Fellowship. On December 25, the Fellowship of the Ring left Rivendell and headed south. In the Misty Mountains, they tried to pass over Caradhras but could not due to overwhelming snow conditions. Gandalf thought it wise to take the rout through the mines of Moria, but Aragorn thought it most unwise. Frodo decided that the mines was a better idea than passage over the treacherous mountain. The Fellowship reached the Doors of Durin on January 13 and Gandalf could not figure out how to open them. He tried a great number of spells and passwords, but nothing worked. He considered what might open the door. On the gate, it read "speak, friend, and enter." Merry figured out that this really meant to say the word "friend" in Elvish and enter. When Gandalf said "friend" in Elvish, the doors automatically opened and the Fellowship hurried into the mines. Gandalf had been to Moria before and he knew the right passages to take to get to the Dimrill Gate in the east of the mines. When Pippin dropped a rock down an ancient well, drums could be heard in the deep. Gandalf scolded Pippin and put him on guard duty for the night, then decided to forgive him and guard the second shift himself. On January 15, the Fellowship reached the Chamber of Mazarbul, where they found the tomb of Balin and the Book of Mazarbul, which revealed that Balin had led a dwarf-colony to reclaim Khazad-dum unsuccessfully. Just then, Goblins and Orcs attacked and the Fellowship fled the chamber. They passed through a door in the east. Gandalf was about to lock it when he heard something even more dangerous advancing, so he abandoned it and kept his strength. The Fellowship soon reached the Bridge of Khazad-dum where Gandalf met their pursuer: a terrifying Balrog. Gandalf shouted "You shall not pass!" The Balrog tried to strike the wizard but his sword was removed. With his staff, Gandalf cracked the Bridge and it soon shattered beneath the evil monster. The Balrog fell into a deep abyss, but he used his whip bring Gandalf with him. The eight remaining members of the Fellowship reluctantly continued their journey. Gandalf and the Balrog fell many miles beneath the surface. Days it took them, fighting while falling. Gandalf was badly wounded, for he was roasted by the Balrog's flame. They finally landed in body of water in the deep. They still battled until they reached the shoreline and fell even deeper into the abyss at the roots of the world. They fought through many caves and tunnels where the world is gnawed by Nameless Things. Gandalf and the Balrog fought as they climbed the Endless Stair. At the top of Silvertine, they fought in the Battle of the Peak and Gandalf finally defeated his enemy and threw his ruin down the mountainside. Gandalf died, but it was realized that he had yet to complete his task. Eru sent him back for a final chance at completing his original task. Gandalf lay naked upon the peak, and was rescued again by Gwaihir and was brought to Lothlorien where he was dressed in white. Gandalf soon realized Frodo was at Amon Hen struggling against the will of the Ring and the Eye of Sauron. Gandalf the White's strong power dismissed Sauron's watch over Frodo and the wizard was left baffled by his own strong will. Gandalf headed to Fangorn Forest and from Treebeard he learned that Merry and Pippin were safe after being captured by Uruk-Hai. On March 1, Gandalf met Aragorn, Legolas, and Gimli and informed them of the Hobbits' safety. They made haste to Edoras where Gandalf released King Theoden from Saruman's spell on March 2. Grima Wormtongue was banished from Rohan and rode to Isengard. Gandalf encouraged Theoden to confront Saruman in battle and ride to Helm's Deep. Gandalf rode with him for some time, but when a Rohirrim scout reported that the Uruk-Hai had reached the river Isen, Gandalf left to gather warriors. Gandalf summoned the scattered survivors of the Battles of the Fords of Isen and was able to gather an army of one thousand riders. Some followed Erkenbrand to Helm's Deep and others followed Elfhelm to Edoras. Gandalf rode to Isengard to find Saruman defeated by the Ents. But Saruman's forces had not fully been defeated. Ten thousand strong from Isengard attacked Helm's Deep. Treebeard sent an army of Huorns to help defend, but Gandalf knew this would not be enough. He himself reached the Battle of Helm's Deep on March 4 with Erkenbrand's forces. They utterly defeated the Uruks and the Dunlendings surrendered. Gandalf and Theoden led a small company to Orthanc. On March 5, they met Saruman. Saruman tried to trick them into agreeing to serve him, and he pretended that he was being mistreated. Gandalf saw right through Saruman's plan and was not fooled. He removed Saruman's staff and banished him from the White Council and, more importantly, from the order of Wizards itself. Grima Wormtongue cast the palantir from Orthanc. It was caught by Pippin, who took a great interest in it. Gandalf took the seeing-stone away from the Hobbit. That night, Gandalf, Theoden, Merry, Pippin, Aragorn, Legolas, and Gimli slept at Dol Baran. As Gandalf slept, Pippin stole the palantir and looked into it. Gandalf awoke at Pippin's scream and demanded to know what the Hobbit had seen. It turned out that Sauron had seen him and thought he had the Ring and was being held captive by Saruman. Gandalf then heard the cry of a Nazgul riding a Fell Beast. The wizard and Pippin rode Shadowfax to Minas Tirith with great haste. Gandalf and Pippin arrived at Minas Tirith on March 9 and in Tower Hall they met Denethor, father of Boromir. Pippin explained how Boromir died and the Steward was saddened. Gandalf, however, had more urgent matters to discuss. The enemy was on the move. Denethor was worried that Aragorn might take Gondor by force. On March 10, Gandalf met Faramir outside the city and realized he was being chased by the Nazgul. He used the light from his staff to scare off his enemies. Faramir entered the city and told Gandalf that he had seen Frodo and Sam in Ithilien. He also informed him that they were led by Gollum and headed for the Pass of Cirith Ungol. Sauron's armies had set out for Gondor several days before and when they reached the city they struck hard. On March 13, Gandalf joined a force of Gondorians who headed back to Osgiliath to help defend. When Faramir returned wounded, Denethor gave up. Gandalf took charge of the forces of Gondor on March 14 and helped lead them to victory in the Battle of Pelennor Fields. On March 15, the Witch-King of Angmar met and confronted Gandalf at the Great Gates of Minas Tirith. After Pippin informed him that Denethor was planning to burn Faramir alive, Gandalf rushed to the rescue. He succeeded, but Denethor killed himself and jumped into the battle field. It was only moments after this event that the Rohirrim arrived. Eowyn and Merry slew the Witch-King in the battle. King Theoden was killed, as were many soldiers of Gondor and Riders of Rohan. After the battle was won, Gandalf told Aragorn he needed to gather all forces and march upon the Black Gate to give Frodo time to destroy the One Ring. The Host of the West reached the gate on March 25 only to be confronted by the Mouth of Sauron. He brought before them Frodo's shirt of Mithril Mail, making it seem as though the Hobbit had been killed. The Battle of the Morannon occurred between the men of the West and the forces of Sauron. When the Ring was destroyed and Sauron fell, Gandalf was overjoyed. He excitedly watched as the Towers of Teeth collapsed with the Black Gate and Barad-dur. Sauron had been defeated. Gandalf rode Gwaihir to save Frodo from the fires of Mount Doom. Gandalf crowned Aragorn High King of Gondor and Arnor on May 1 in Minas Tirith, then left the city with the reunited Fellowship in June. Gandalf went to visit Tom Bombadil in the Old Forest after parting from the Hobbits in Bree. He warned that trouble awaited in the Shire, and that the Hobbits would see him once more later on. On September 29, 3021, Gandalf reached the Grey Havens. From there, he took a ship to the Undying Lands from where he had come. The Lord of the Rings, Appendix B: "The Third Age;" "Of the Rings of Power and the Third Age"
The Unfinished Tales: "The Istari," passim; "The Quest of Erebor"
The Silmarillion: "Valaquenta: Account of the Valar and Maiar According to the Lore of the Eldar"
Olorin lived in Valinor and became friendly with Valar and Elves. He was selected to go to Middle-Earth. Gandalf and the other Istari reached Middle-Earth. Cirdan gave Gandalf the Ring Narya. The White Council realized that there was evil that took base in Dol Guldur in Mirkwood. The White Council worried that the evil presence could have been Sauron. Gandalf took action and rushed to Dol Guldur to find that Sauron hid in the east. The White Council was officially formed. Gandalf went to the Shire to help the Hobbits survive the Long Winter. When Gandalf went to Dol Guldur, he learned that the evil presence was indeed Sauron. From one of Sauron's prisoners, Thrain, Gandalf received the key and map of the Lonely Mountain. When the White Council met, Gandalf encouraged the members to attack Dol Guldur, but Saruman convinced them not to. March 15: Gandalf and Thorin Oakenshield, son of Thrain, met at Bree and they decided to reclaim the Lonely Mountain from the dragon Smaug. April 25: Gandalf went to Bag End in the Shire attempting to interest Bilbo Baggins in the quest. He failed, and Bilbo stubbornly refused. April 26: Gandalf brought the party of Dwarves to Bag End. Bilbo finally joined. April 27: Bilbo and Gandalf set out with Dwarves for the Lonely Mountain. May: After tricking some Trolls and turning them into stone, Gandalf received the sword Glamdring. June: The company camped in Rivendell with Elrond. Mid-Summer: Gandalf saved the Dwarves from the Goblins and chopped off the Great Goblin's head. Bilbo became lost in the caves before reuniting with Gandalf. Later Summer: Gandalf left the company on the borders of Mirkwood. He rushed to meet the White Council and they attacked Dol Guldur. Sauron fled. Fall: Gandalf found that there was quarreling over jewels at the Lonely Mountain and heard that Goblins were coming. He united the Men, Elves, and Dwarves in the Battle of Five Armies. Early: Sauron took base in Mordor. May 1: Gandalf and Bilbo reached Rivendell. June 22: Gandalf got Bilbo home to the Shire successfully. Gollum came out of the Misty Mountains. Gandalf continued to track him. Gandalf joined Balin in visiting Bilbo at Bag End. Gandalf lost track of Gollum's trail when the creature turned toward Mordor. It had been recently revealed that Sauron was living there. The White Council met yet again and Saruman said that the One Ring was lost in the depths forever. Gandalf and Aragorn met for the first time. They became great friends. September 22: Gandalf attended Bilbo's Farewell Party in the Shire. Later Fall: Gandalf suspected that Bilbo's Ring might be the One Ring of Sauron. He and Aragorn decided to continue hunting for Gollum. Gandalf went to Minas Tirith and found the scroll engraved upon the One Ring by Isildur. March 23: Gandalf found out the Gollum had had the Ring and hunted for him in Mirkwood. He found him. March 29: Gandalf headed for the Shire. April 12: Gandalf reached Bag End. April 13: Gandalf revealed to Frodo that the Ring he possessed was indeed the One Ring of Sauron. The Hobbit offered to take it far away. Mid-year's: Gandalf saw Radagast in Bree-land. Radagast informed him of the nearby Nazgul. Gandalf was told to meet Saruman and warn Frodo. July 10: Saruman revealed himself to be a traitor and imprisoned Gandalf in Orthanc. September 18: Gwaihir the Windlord saves Gandalf from Orthanc. September 20: At Edoras, Gandalf was told by Theoden to leave with any horse. September 21: Gandalf met Shadowfax. 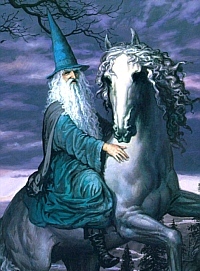 September 23: Gandalf tamed Shadowfax. September 29: Gandalf was told by Gaffer that Frodo departed from the Shire with companions. October 3: Gandalf battled the Nazgul on Weathertop and escaped the next morning. October 18: Gandalf reached Rivendell. October 20: Frodo arrived at Rivendell and Gandalf helped Elrond defeat the Nazgul. October 25: The Council of Elrond met. Gandalf advised the members that the Ring must be destroyed in Mordor. December 25: The Fellowship left Rivendell with the Ring. They headed south. January 13: The Fellowship entered Moria after realizing it was their only choice. January 15: Gandalf and the Balrog fell off the Bridge of Khazad-dum. January 23: Gandalf and the Balrog fought to the top of the Silvertine in the Battle of the Peak. January 25: Gandalf was victorious. Though he died, Eru granted him his life back. February 17: Gwaihir saved Gandalf from the peak and brought him to Lothlorien. February 20: Gandalf left Lothlorien and headed south. February 25: Gandalf reached Fangorn Forrest. February 26: Gandalf mentally save Frodo at Amon Hen. March 1: Gandalf reunited with Aragorn, Legolas and Gimli in Fangorn. He rode swiftly on Shadowfax to Edoras. March 2: Gandalf and his companions reached Edoras where Gandalf freed Theoden of Saruman's hold. He then encouraged war with Saruman. March 3: Gandalf gathered an army of Rohirrim and Ents to help fight off the armies of Isengard. March 4: Gandalf, Erkenbrand, and their armies arrived at the Battle of Helm's Deep. March 5: At Isengard, Gandalf removed Saruman's staff and banished him out of the Order of Wizards. Pippin looked into the palantir, as did Aragorn. Gandalf and Pippin hastily rode to Minas Tirith. March 9: Gandalf and Pippin reached Minas Tirith to find and stubborn Steward, Denethor II. March 10: After rescuing Faramir, Gandalf waas told that Frodo and sam were heading to Mordor with Gollum as their guide. March 14: The Siege of Gondor occurred. Gandalf headed the defense since Denethor had become deranged. March 15: At the Battle of Pelennor Fields, Gandalf met the With-King head on at the Great Gates of Minas Tirith, but retreated to save Faramir from Denethor's madness. Denethor committed suicide. March 16: Gandalf realized that Frodo needed time to destroy the One Ring. To distract Sauron, Gandalf decided Gondor and Rohan must unite against Mordor at the Black Gate. March 18: The armies of the West reached the Black Gate. March 25: The Mouth of Sauron came forth to encourage surrender, but Gandalf stood and fought. The Western forces succeeded in their goal to give Frodo time, and the Ring was destroyed and Sauron defeated. May 1: Gandalf crowned Aragorn High King of Gondor and Arnor in Minas Tirith. October 30: Gandalf took his leave of Frodo and his companions and visited Tom Bombadil. Gandalf left Middle-Earth with the Elves, Frodo, and Bilbo. They passed over the sea to the Undying Lands. Gandalf means "staff elf" in a language of men. It referes to the wooden staff he carried. 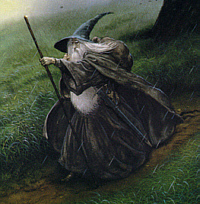 The name Gandalf also appears in an Old Norse poem called Voluspa. Grey: Gandalf first wore grey robes and was known for the color. 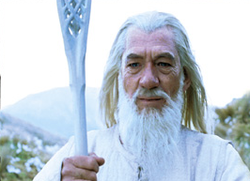 White: Gandalf was reborn as Gandalf the White on the peak of Silvertine. Saruman became colorless. 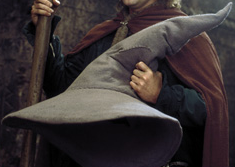 Gandalf was first known as Olórin as a Maia in Aman. Olor and olos mean "vision" in High-Elven. Gandalf was called the Grey (name) because he wore grey. Pilgrim and wanderer imply that he had no home and was a traveller. He was called Messenger when he arrived in Middle-Earth because he was a messenger of the Valar. Mithrandir is the Elvish word for Grey Pilgrim or Grey Wanderer. It refers to the fact that the wizard travels with no fixed dwelling. Tharkûn means Gandalf in Dwarvish. Incánus was the name for Gandalf in the south. It means "north spy" in Haradrim. It is also a Quenya word used by the people of Gondor, derived from in meaning "mind" and cánu meaning "leader" or "ruler," literally translating to "mind leader" or "mind ruler." In Latin, incánus translates as "grey haired." Gandalf was called Greyhame by Eomer in reference to his grey coat. The word is derived from the Old English grég or graég meaning "grey" and hama meaning "coat" or "clothes." In contrast to the wicked black riders, or Nazgul, Gandalf was called the White Rider by Aragorn and the Gondorians. He was their symbol for hope and peace. Gandalf was called Gandalf Stormcrow by Theoden while under the spell of Saruman. It was meant to be an insult. Gandalf was called Láthspell by Grima Wormtongue, who feared him. Láthspell means "ill news" in Old English. It is derived from láð meaning "bad" or "evil" and spell meaning "story" or "news." As an insult, Denethor referenced Gandalf as the Grey Fool. The top two images are of Ian McKellen playing Gandalf in the New Line Cinema film Trilogy of the Lord of the Rings directed by Peter Jackson. The painting on the mid-left is of Gandalf riding Shadowfax by artist Ted Nasmith. The mid-right painting is of Gandalf in the Shire by artist John Howe. The image at the very bottom is a Decipher Card image of Gandalf the Grey's hat.